I was chatting with a paleo friend the other day and we both thought it odd that when we are sick, we seem to crave foods that are bad for us. I've had bronchitis for the past week and have been craving pizza. Shame on me. 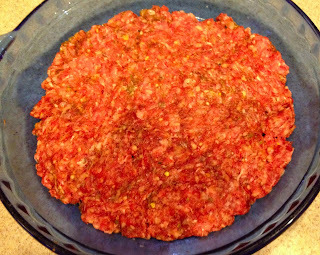 I've seen many people say that making Meatza can quell the desire to have real pizza, so I decided it was high time for me to make Meatza from Melissa Joulwan's Well Fed. While thinking about making this I looked the recipe up on her blog before looking at the printed version. I gathered my ingredients based on what the online version called for which was a little different from the printed version. I was at first going to make my own sauce, but then decided against it as I had a bottle tomato and basil sauce with clean ingredients in the refrigerator. So perhaps this picture is useless other than to show my favorite color in the kitchen, blue, is awful for food photography with my iphone. To make the Meatza exactly as the recipe is written in the book, you'll need to make her Pizza spice blend and Italian Sausage Seasoning. It took me 2.5 minutes to mix up each of these blends plus a minute or two to dig these spices out of my pantry. Each blend uses several spices in common. 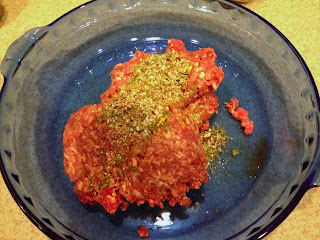 I didn't add fennel to my batch of the sausage seasoning because I didn't have any on hand. Because I decided to use ready made sauce after starting to prepare, I ended up not needing the pizza blend, but I'll find a use for it. After mixing up the spice blends, I started to prepare the dish in earnest. I turned the oven on to pre-heat to 400 degrees. 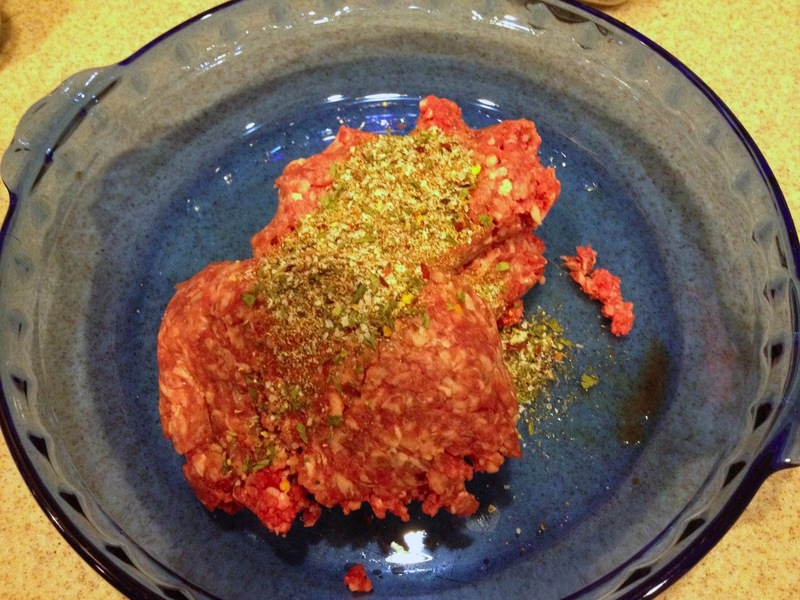 I then took the pound of ground beef and mixed in the Italian Sausage spice blend. The online version of the recipe doesn't call for two dishes/two meatza crusts, so I had to find another dish that would be suitable. 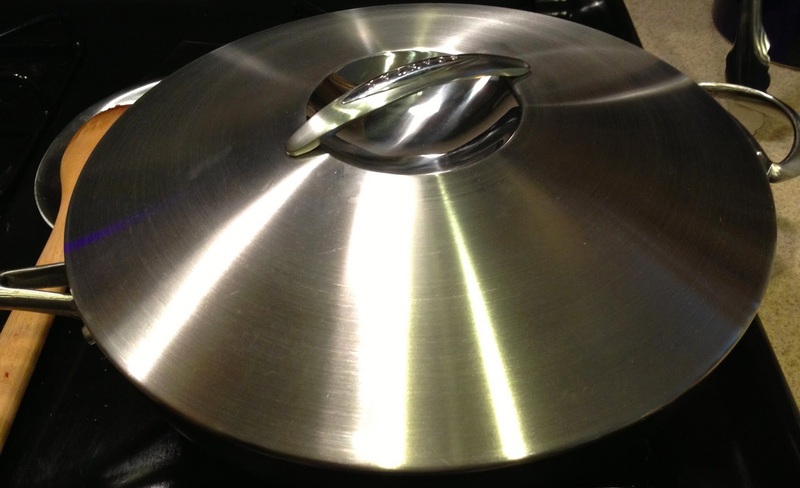 I decided upon a round cake pan. The recipe says you can use a square pan as well, but as I was trying to satisfy some pizza cravings, I decided to stick with round. I pressed a half pound of the beef into each pan. At first, you may not think it will spread all the way to the edge, but if you work with it for a minute or two, you can get an even layer across an 9 inch cake pan/pie dish. I put both "crusts" into the oven and set a timer for 15 minutes. I then started to prepare my toppings. When I order pizza, I usually get pepperoni, mushrooms and onions. While I think pepperoni would probably be awesome I didn't have any on hand. 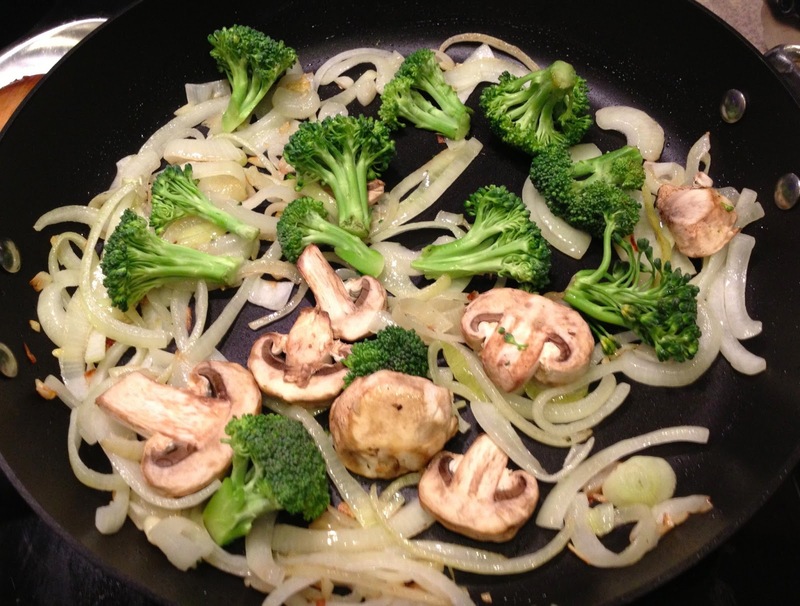 I did have mushrooms, onions and broccoli. 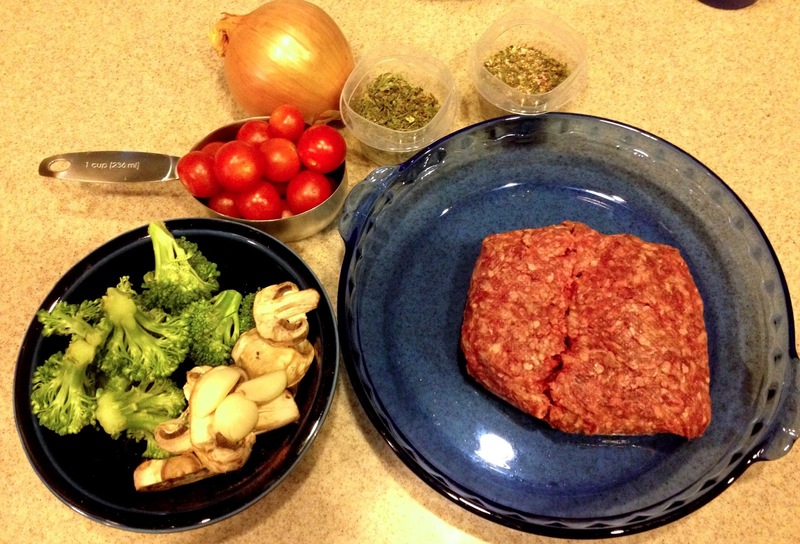 The mushrooms I bought sliced and the broccoli was bagged and washed. I decided to cook the onions low and slow to try to get them a bit caramelized. I added them and 3 cloves of chopped garlic to my brand spanking new scanpan 12 inch covered skillet with 1 tablespoon of coconut oil on medium heat. 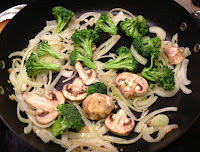 After about 10 minutes, I added the broccoli and mushrooms and put the flying saucer, I mean lid, on to the pan to let them steam saute for a bit. When the timer went off, here is what I had. I don't know why, but I wasn't prepared for all of the grease and the shrinkage. I should have at least been prepared for the grease. I carefully removed each "crust" with the widest turner I had to a foil lined baking sheet. 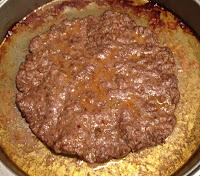 I blotted them with paper toweling to remove the extra grease. Both meatza crusts fit on to one baking sheet. Next, I added 1/4 cup of tomato sauce to each crust and spread it as I would if making a real pizza. I then added the vegetables to the meatzas with tongs. The tongs allowed me better control at topping placement. I put the baking sheet into the oven and set the timer for 15 minutes. I checked the meatzas at about 13 minutes and decided they were done. Here is the finished dish. I attempted to cut a slice. Accessibility & Cost of Ingredients: You should be able to find all of the ingredients you need for this dish at your "big box" grocery store. Preparation & Cooking Time: The total preparation for this dish for me was 20 minutes. To be fair, some of this was me staring at the cookbook figuring out the differences between what I thought I was going to do based on what I had read online and what the book said. If I make this again, it will likely take a bit less time. The stated preparation time is 15 minutes. 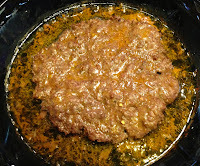 The preparation time for this recipe is going to vary depending on the toppings you decide upon as well. 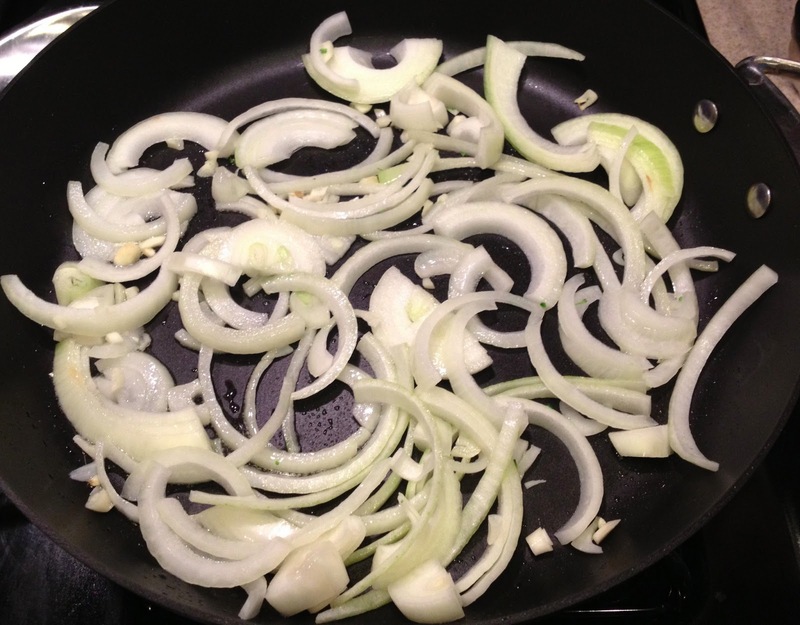 For me, my vegetables, but for the onion, were pre-sliced. The total cooking time was 28 minutes. Clean Up: I used paper towels to sop up the extra grease in each baking pan before pre-washing them to go into the dishwasher. The baking sheet was clean underneath the baking foil. I hand washed my pan and wooden spoon. The Paleo Review: Meh- as a pizza substitute & Thumbs Up- as a dish in its own right. 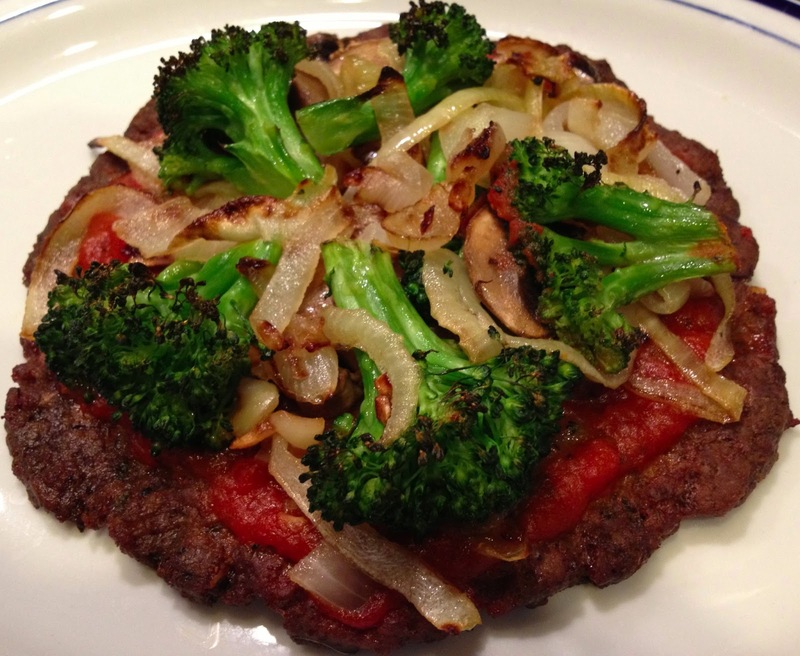 If I hadn't gone into making this dish thinking it would satisfy my craving for real pizza, I would probably say this is a good dish when your looking for a different way to present your standard paleo meat and vegetables. 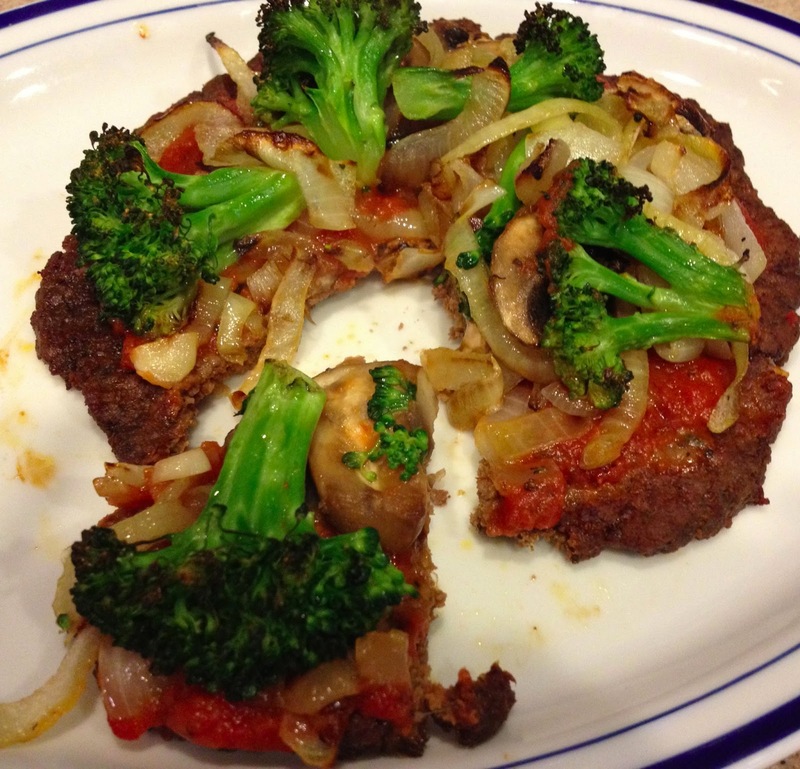 The broccoli might not have helped with my desire for authentic pizza, but it's a topping she suggests. To be fair, she suggests many variations to try with this dish. I'm going to make this again with different toppings (perhaps pepperoni) and see how I like it. Blog Note: Have you entered my Paleo Powder giveaway yet? Why not? I've not found anything so far that I haven't liked this spice blend on. 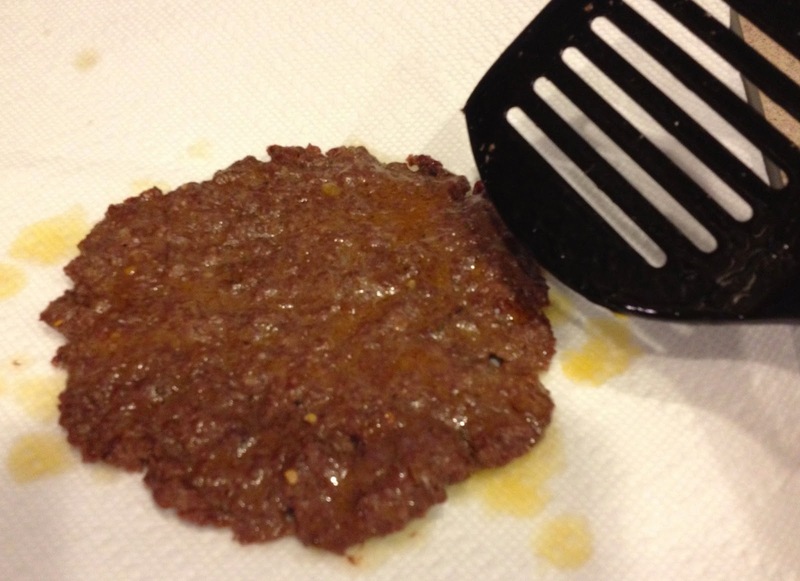 Of course, if you'd like to just buy some Paleo Powder, you can do so here.